Earnings before interest, taxes, depreciation and amortization (EBITDA) is commonly used to assess financial health and evaluate investment decisions. But sometimes this metric overstates a company’s true performance, ability to service debt, and value. That’s why internal and external stakeholders should exercise caution when reviewing EBITDA. The market’s preoccupation with EBITDA started during the leveraged buyout craze of the 1980s. The metric was especially popular among public companies in capital-intensive industries, such as steel, wireless communications and cable television. Many EBITDA proponents claim it provides a clearer view of long-term financial performance, because EBITDA generally excludes nonrecurring events and one-time capital expenditures. Today, EBITDA is the third most quoted performance metric — behind earnings per share and operating cash flow — in the “management discussion and analysis” section of public companies’ annual financial statements. The corporate obsession with EBITDA has also infiltrated smaller, private entities that tend to use oversimplified EBITDA pricing multiples in mergers and acquisitions. And it’s provided technology and telecommunication companies with a convenient way to dress up lackluster performance. 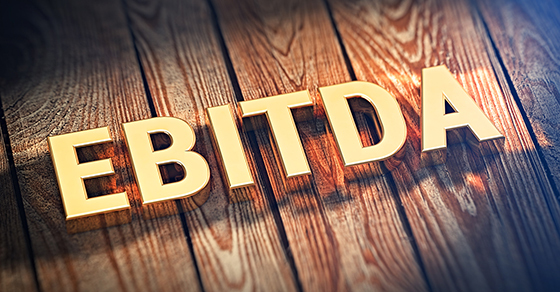 EBITDA isn’t recognized under U.S. Generally Accepted Accounting Principles (GAAP) or by the Securities and Exchange Commission (SEC) as a measure of profitability or cash flow. Without formal guidance, companies have been free to define EBITDA any way they choose — which can make it difficult to assess company performance. For example, some analysts when calculating EBITDA subtract nonrecurring and extraordinary business charges, such as goodwill impairment, restructuring expenses, and the cost of long-term incentive compensation and stock option plans. Others, however, subtract none or only some of those charges. Therefore, comparing EBITDA between companies can be like comparing apples and oranges. Moreover, the metric fails to consider changes in working capital requirements, income taxes, principal repayments and capital expenditures. When used in mergers and acquisitions, EBITDA pricing multiples generally fail to address the company’s asset management efficiency, the condition and use of its fixed assets, or the existence of nonoperating assets and unrecorded liabilities. In fact, many high profile accounting scandals and bankruptcies have been linked to the misuse of EBITDA, including those involving WorldCom, Cablevision, Vivendi, Enron and Sunbeam.